Whether your party is on the run after escaping an icy prison or hunting mythical creatures that emerge only in winter, no Game Master wants to spend time drawing every snowbank and icicle-laden copse of pines. Fortunately, with Paizo's latest Pathfinder Flip-Mat, you don't have to! 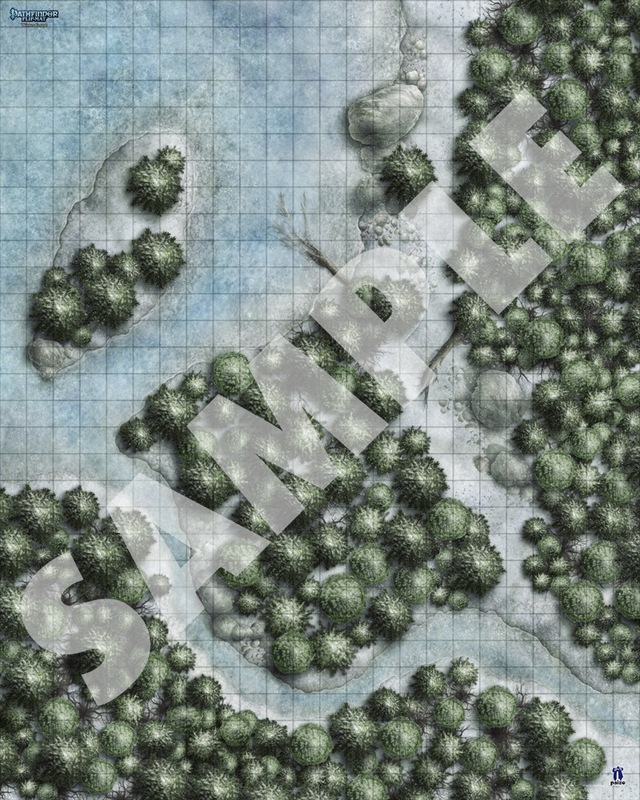 This line of gaming maps provides ready-to-use fantasy set pieces for the busy Game Master. Full of beautiful details, including a frozen lake and a snow-draped cave entrance, this double-sided map makes the perfect setting for forays into the bone-chilling cold! Don't waste your time sketching when you could be playing. 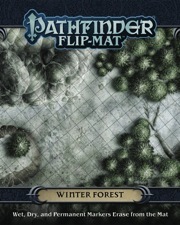 With Pathfinder Flip-Mat: Winter Forest, you'll be prepared next time your players head out into the winter woods! 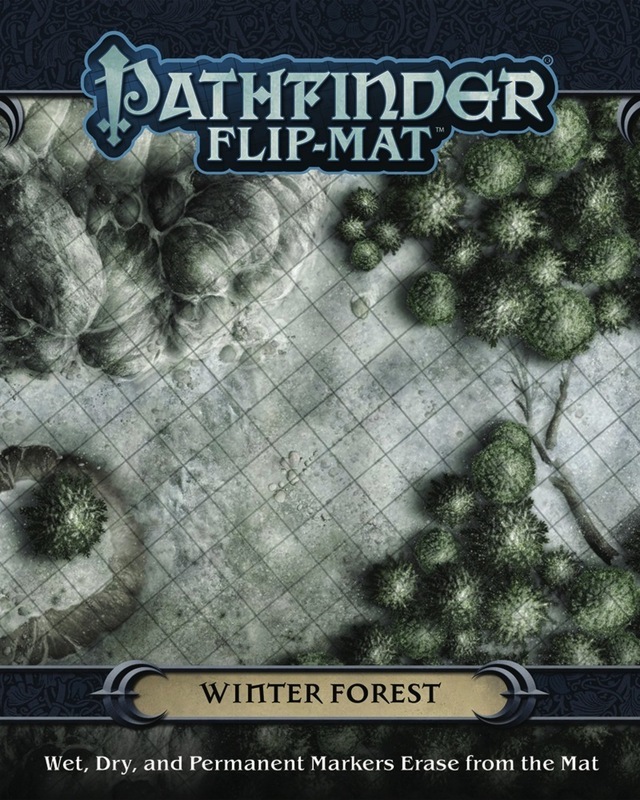 There aren't a lot of options available for winter scenes, so I've used the Winter Forest flip-mat several times in both campaign and PFS/SFS play. One side features a frozen river and lake, complete with a small island in the middle. The other side features the snow-covered cliffs of a boulder-strewn hillside and a couple of paths winding their way through the trees. There are some little touches, like fallen logs, but overall the designer has avoided making the scene too busy (a plus in my book). 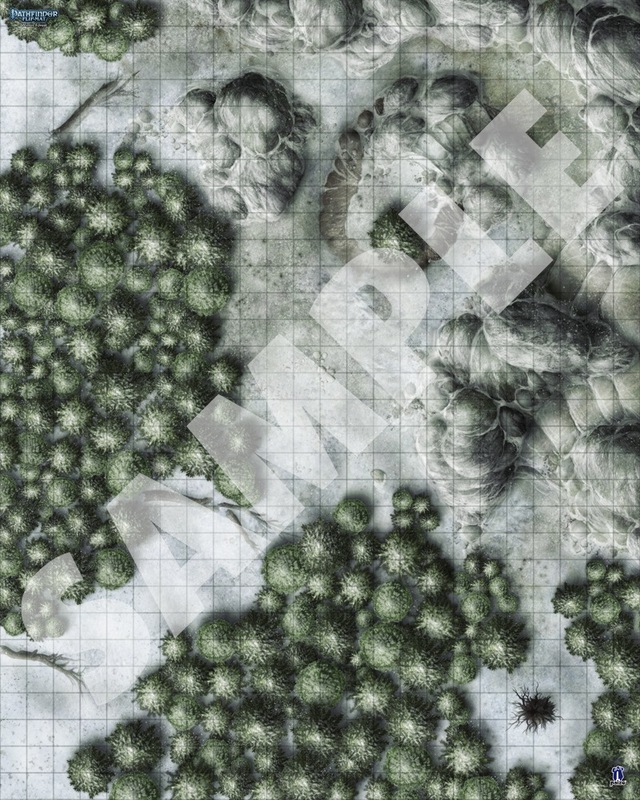 My tip for GMs would be to plan ahead of time how the trees affect movement and cover, to think about whether special rules will be used to represent movement through the snow and ice, and finally to think about how tall and difficult to climb the boulders will be. There's not really much else to say about this one--it's a good, attractive flip-mat that does its job well and that I expect to use frequently in the future. I have a group that likes Irisden and Viking themed type games and this map comes in very handy. The artist did wonderful work on both sides of the map and the variety of aspects to it (lake, forest, open spaces) is very well balances that allows for a high amount of usability. Good but the rocks & lake are a hindrance. A winter wood was needed. The frozen lake, while nice too look at limits the usability. The mountain/rocks take up half of one side and make it impossible to create a larger winter wood. they should have been left away, so one side has only the advocated woods. Paizo needs to produce less specific maps that can be put together to form larger maps. Need to see some sample images with actual winter/snow terrain. Is this supposed to for Giantslayer, but meeting other needs as well? They usually don't have images available until closer to when the map actually comes out because they maps aren't made yet. Updated with final product image, description, and sample images! I'll hopefully still get some use out of these at least, I'm DMming Reign of Winter right now (wrapping up Adventure 1 soon), so by the time these arrive there should still be plenty of opportunity to fit them in somewhere. I can probably also lift some smaller elements out of it for handmade maps on the VTT as well, such as the snowy trails surrounded by trees and the river/lake. Looks awesome! Looking forward to more snow maps. Awesome. Love the lake. Love the other mountain edge. Is the PDF version all ready for me to take to a Kinkos and print? Or do I need to rescale and play with the pdf?